I've always admired Roman glass created during the 1st through the 4th century A.D. During this period Roman glass was created and used within the rhythm of everyday life. Glass production was so prevalent that it rivaled pottery of the same period. One can safely say that in no small way the production of Roman glass set the foundation for the glass industry of today. 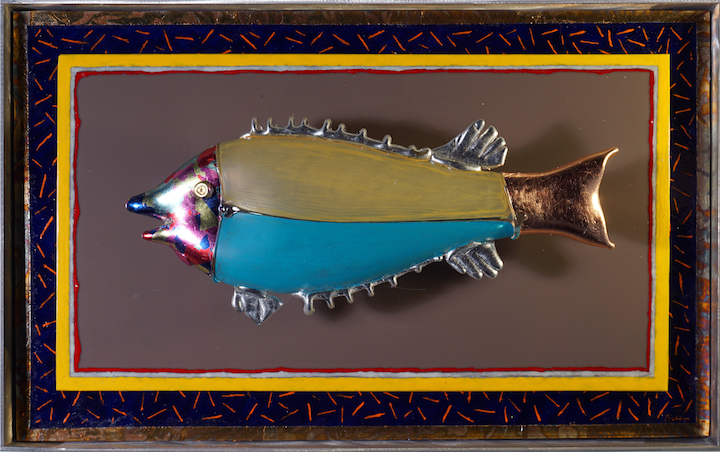 The glass fish pictured here was produced in Cologne and resides at a museum in that city. When I first saw this object I was immediately captivated by its grace and fanciful form. Although I've only seen it in pictures it still reflects a dynamic, humorous quality. In 1998 during my last year teaching, my good friend Fritz Dreisbach was demonstrating glass blowing to my students. Using the picture seen here I had him blow as close a copy as he could. This was to be the start of a series of works that continues to this day, (2014). Although I've been retired from teaching for 16 years Fritz still blows a couple of fish for me whenever we're together and in a hot shop. 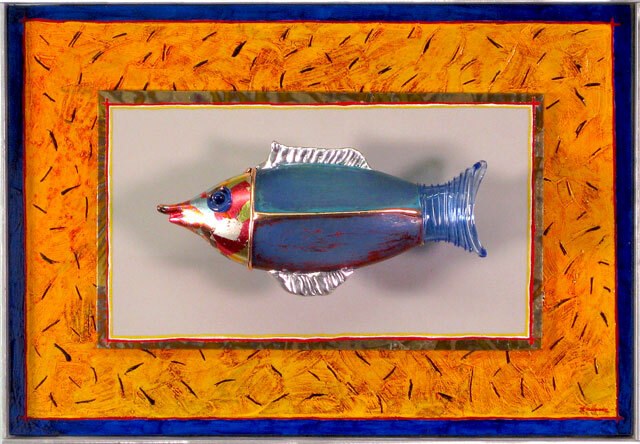 The fish he makes for me still stay within the style of that original Roman one but they have now taken on a life of their own and reflect my contemporary spirit. The pieces below are recent and are a homage to those Roman glass artisans. 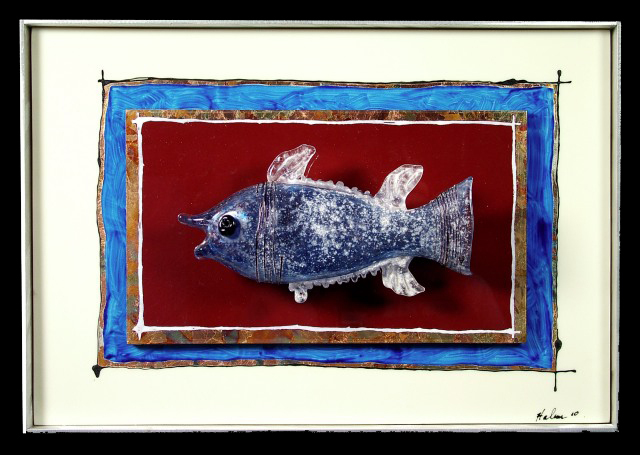 Blue Fish 2 – Blown and treated with scavo, vitreous enamel. 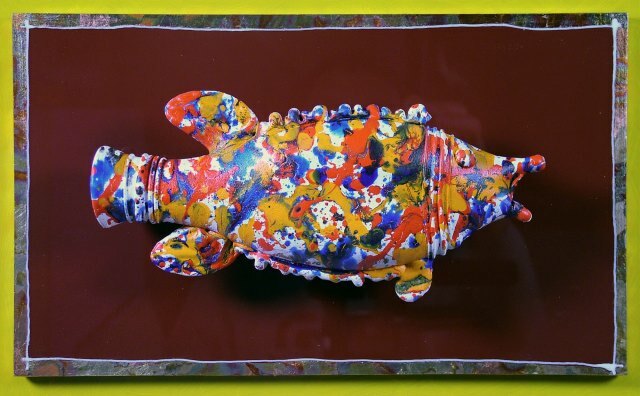 18" x 12"
Pollack – Blown and treated with acrylic paint, vitreous enamel, precious leaf. 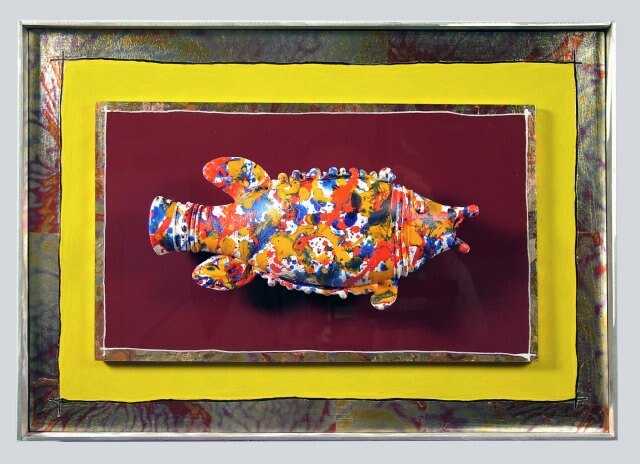 18" x 12"
Bi-color Fish (2018) – Blown glass treated with light acid, vitreous enamel, precious leaf, acrylic ink. 18" x 12"